would you find Wind Turbine? 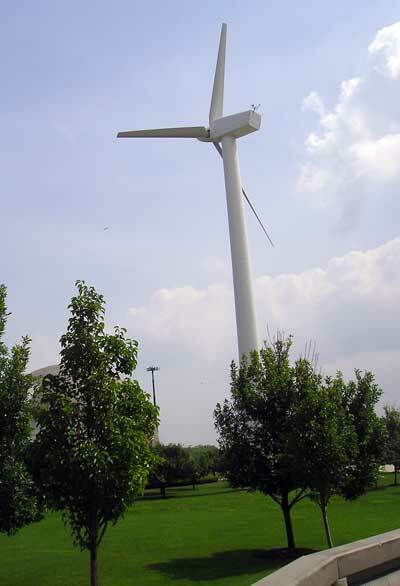 This wind turbine's total height is about 150' which makes it about 13' shorter than its neighbor - Cleveland Browns Stadium. 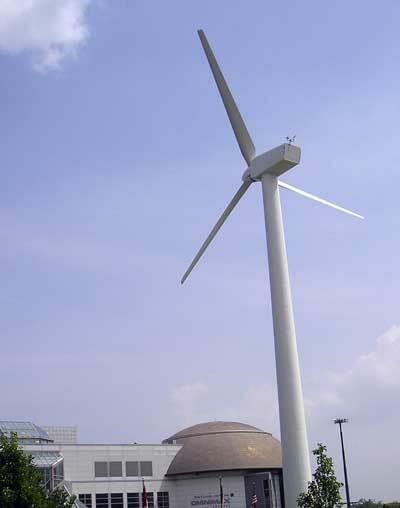 The first Cleveland lakefront wind turbine is installed on the front lawn of the Great Lakes Science Center. The turbine is expected to provide an estimated seven percent of the Science Center's annual electrical needs, but energy cost-saving is not the primary objective according to Science Center President and Executive Director Linda Abraham-Silver. "The project brings our mission of demonstrating the interrelationship between science, the environment and technology to life," said Abraham-Silver. "We decided to install the turbine on our front lawn for its visibility - for pedestrians visiting North Coast Harbor attractions, motorists on the Shoreway and downtown workers and visitors. We want to raise awareness, engage curiosity and encourage discussion, just as we do with our indoor signature exhibits and programs." 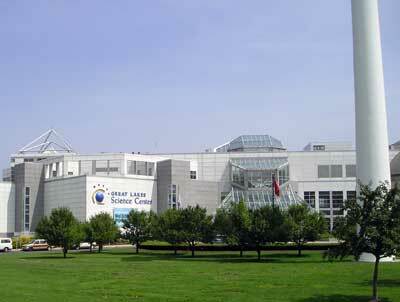 The Science Center is also developing related exhibits for indoor installation including interpretive panels on the science and technology of the turbine, an example turbine blade, and a touch screen kiosk with visitor friendly interface providing both real-time and historical data visualizations. Kiosk data visualizations include wind speed, power generated over time, and the amount of carbon dioxide not generated for the power equivalent.
. The turbine needs a breeze of eight miles per hour (mph) to generate power and at 31 mph it achieves its peak output of 225 kilowatts.